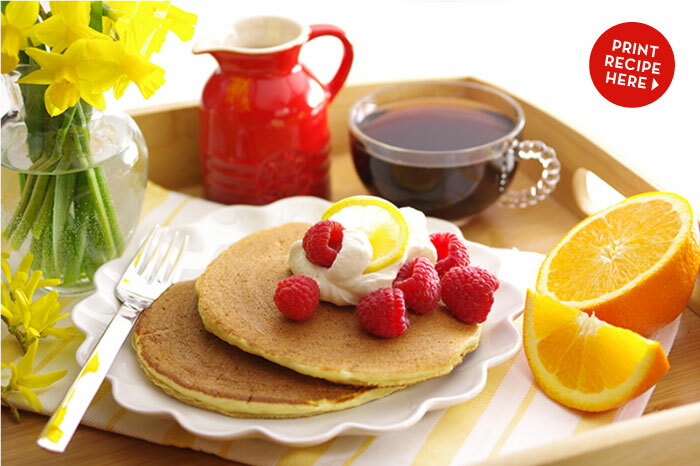 These pancakes have a real springtime personality with their bright flavor and airy, light texture. But don’t let that description fool you! The ricotta cheese in these cakes lends a hearty, high protein character to this breakfast entrée. You’ll find that they cook into a slightly thicker pancake, yet still fluffy in texture. A sweeter version than many pancakes, all that’s needed for a topping is a dollop of sweet cream and fresh fruit. 1. 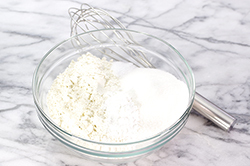 In a small bowl, mix the dry ingredients together: flour, sugar, baking powder, and salt. Set aside. 2. Separate the eggs. 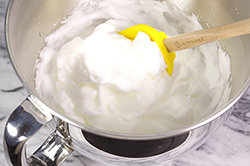 Whip the egg whites until medium peaks form. 3. 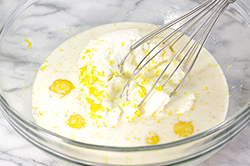 In a large bowl, combine the egg yolks, ricotta, milk, lemon zest, and vanilla with a hand mixer or vigorously with a whisk. By hand, stir in the dry ingredients. 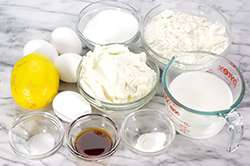 Gradually fold in the beaten egg whites until combined with gentle motions in order to maintain the loft that the beaten egg whites offer. 4. 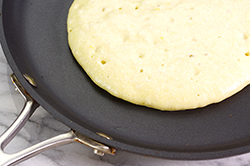 On the stovetop over medium to medium-low heat (about 325°F), heat a nonstick griddle. Lightly swipe an oiled paper towel on the griddle’s surface, if desired. 5. Pour about 1/3 cup batter onto the griddle. (Adjust batter amount according to the size of pancakes desired.) Allow the pancake to cook until air bubble craters form on the surface and the underside is a nice, golden brown. Flip the pancake and finish cooking the second side. 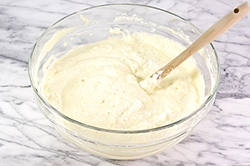 Place the pancake on a heatproof platter in a warm (200°F) oven, or in a tortilla warmer while making the remainder of the pancakes. 6. Top the pancakes with a generous dollop of sweetened whipped cream and raspberries. 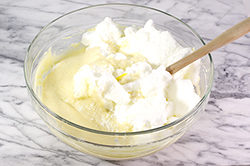 (Prepare the whipped cream by beating the cream, powdered sugar and vanilla until soft peaks form.) Garnish with lemon slices and fresh mint leaves.